Tear it down. The city is still paying for this enormous, hideous structure and gaining very little from the revenues they claim to receive. And *we* elect these people? 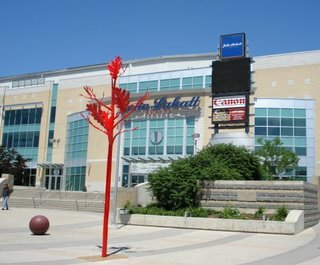 A $6.4-million, 10-year deal for naming rights will see the decade-old centre become Budweiser Gardens in October. City council voted 12-3 Tuesday in favour of the name change [..] Coun. Nancy Branscombe, who said “Budweiser Gardens sounds like a beer tent to me,” said she meant to vote against the deal, but pushed the wrong voting button. An expensive beer tent at that. London is going to go bankrupt if it keeps throwing money at bread and circuses. Hockey hair and has been musicians aren't going to do anything to prevent sinkholes, potholes and rising property taxes. Even these buffoons can't push the "right" button, so you can be assured we are doomed. But those of us who have lived in London, Ontario for many years already know this. Just have a look at the metal trees that adore the crumbling streets. Categories: Downtown London, Who owns London?